An inspection after mold remediation is necessary, because it confirms that the contractor for the remediation has successfully completed the project. Or it will identify any areas that still need remediation so that the contractor can get right to it before the mold spreads. For that reason alone, your remediation company should welcome the follow-up inspection as confirmation that their job is done. You may have the utmost confidence in your remediation company and with good reason. We are not trying to convince you differently. The thing is that mold can be an elusive foe. It lives undetected behind walls and hides away in places such as ducts and crawl space. Even the most experienced mold remediation company can miss some spots on occasion. If you have employed a less experienced contractor, you may have more cause for concern. The post-remediation inspection also brings you peace of mind. You can be absolutely certain the air in your home is not filled with microscopic spores spreading around any number of physical discomfort or illnesses. The inspection report also will satisfy disclosure requirements for a home buyer or demonstrate that you have practiced due diligence in handling the mold problem should you need to respond to a formal complaint (such as a landlord would) or a lawsuit. The inspection typically is performed by the mold inspection and testing company that performed the original inspection. This ensures that the same methods are used for both inspections: the same volume of air collected, brand of spore trap used, and laboratory doing the analyses. The consistency in inspections provides optimum accuracy and reliability when making a comparison between before and after the remediation. A post-remediation inspection (aka a verification survey or clearance testing) includes a visual inspection, moisture assessment and air quality testing performed no earlier than 24 hours and preferably 48 hours after mold remediation is completed. Please note that, during the interim, windows and doors should remain closed. Visual inspection entails confirming there are no water-damaged non-structural materials left behind and, of course, there is no mold in sight. Photos are usually taken as documentation. Then the inspection crew use moisture meters and infrared cameras to detect moisture in difficult-to-access areas. Air quality is then tested for the presence of airborne mold spores with the outdoor air acting as a control. If all is well, the mold inspection company “passes” or “clears” the project and submits a written report to all relevant parties. 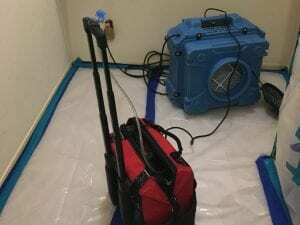 The report identifies the inspection methods and verifies that the remediation was completed in compliance with the protocol developed based on the original inspection and that the underlying cause of the mold was remediated and it is reasonable to assume that mold will not return from that cause.